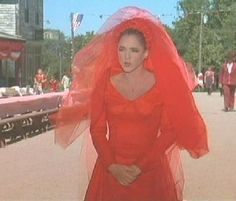 In the course of film history, most gay men have been either the villain (Peter Lorre's Joel Cairo in The Maltese Falcon or John Dall and Farley Granger in Rope) or the subject of ridicule (many examples in comedies of the era, but the best example is John Ritter's Jack Tripper on the TV show Three's Company. Tripper isn't actually gay, but the fact that he is pretending to be gay and how his "gayness" is treated by society is a good illustration). Society itself could be blamed, but a major factor was the Hays Code which ruled with an iron truncheon over what could and could not be presented on film. 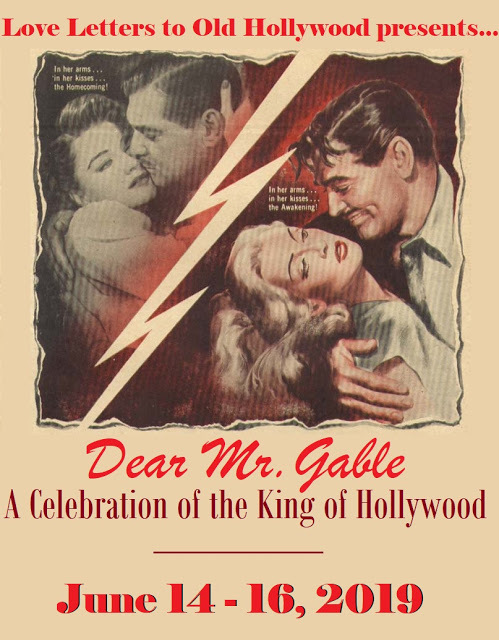 Because homosexuality was considered a disease by the prevailing authorities, even so far as to being a cause to be arrested for being a homosexual in the real world of the time, the Hays Code established that a gay person on film had to be presented in a negative light. This gradually began to change in the 1970's. According to my research for this post, the turning point was considered to be the Stonewall riots, an event that occurred in 1969 in New York City in response to police raids on a gay bar, the Stonewall Inn, in Greenwich Village. The resulting exposure and outcry of the LGBT community caused the rest of the world to begin change in its view of the homosexual. 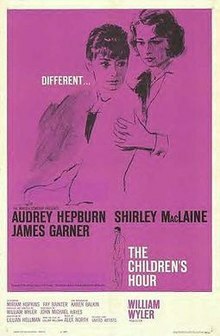 This also made its way to Hollywood, where always with its eye on the bottom line, the studios began to see possibilities of the LGBT dollar in the theater. Before this gets to be a tedious history lesson (or is it already too late?) I will end this ramble, but the fact is that homosexuality is not viewed in such a negative light these days. 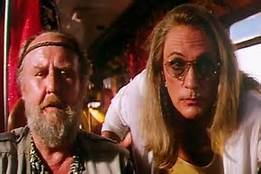 In the mid 1990's alone, there were two movies that presented an entertaining look at the world as viewed by "drag queens". 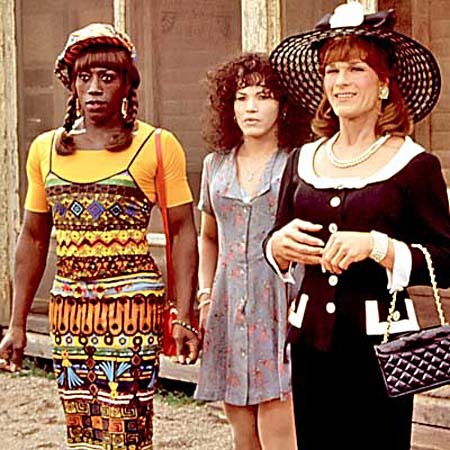 A drag queen, to quote Wesley Snipes' character in To Wong Foo, is "a gay man [who] has way too much fashion sense for one gender". The ostensible star of this movie (aside from the titular bus, anyway...) is Hugo Weaving, an Australian actor who came to prominence in the United States from such high exposure roles as Elrond in the Lord of the Rings trilogy, or if you like your films dense and confusing, as Agent Smith in The Matrix movies. Weaving plays Tick, a gay man who performs a drag queen show under the name "Mitzi". The true star, in my opinion, however, is the legendary Terence Stamp, who won the Golden Globes for Best New Actor in his very first role as the titular character in Billy Budd (1962), and has been dozens of movies since, including a few of my favorites (Superman II, Wall Street, Alien Nation, The Limey). Stamp plays a transgender woman, Bernadette, who has recently lost a lover. Rounding out the cast is Guy Pearce. Pearce is also a native Australian, who came to attention outside Australia when he appeared in L. A. Confidential. I did not see that one until much later. 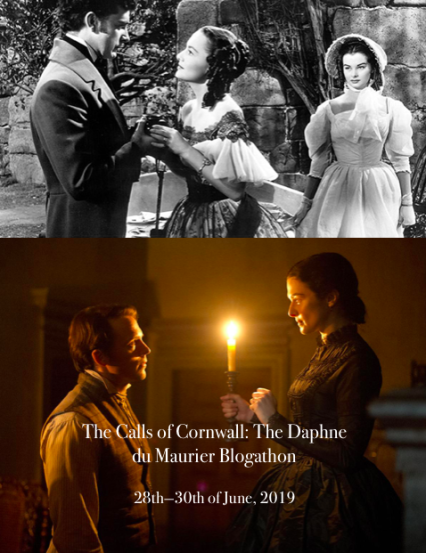 My personal introduction to Pearce was as the scientist who invented The Time Machine in the early 2000's remake of the classic film of the same name, and the following year in with Jim Caviezel in The Count of Monte Cristo. Pearce plays a rather flamboyant and exuberant gay man named Adam, who does his drag queen show under the name of "Felicia". 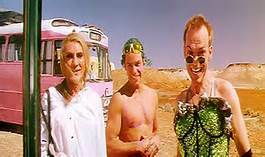 In the beginning of the movie, Tick gets a call and is invited to come to Alice Springs to perform his cabaret. The cabaret, it turns out, is that he and his entourage dress up in drag and perform by lip-synching to various "hit" songs. Tick calls up his friend Bernadette, who has recently lost her lover, and invites her to come with him, conveniently neglecting to tell her that Adam will also be accompanying them until it's too late for her to back out. Neither knows, as yet, that Tick is going because the person that requested his performing troupe is his wife. 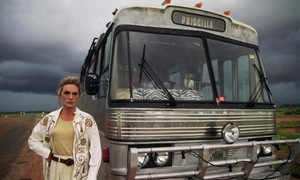 Adam, for his part, manages to acquire a run-down tour bus for the trip, which he promptly dubs "Priscilla" (the titular "Queen of the Desert"). The three take off for their trip from Sydney to Alice Springs. They stop over on their first night, but are not received very well with the populace of the town. This is repeated several times during the course of the movie, in which due to the prevailing fears, prejudices, or just seething hatred for their homosexual-ness, are alternately threatened or abused. After awakening from their overnight stay the first night they find their bus vandalized with the words "Aids F***ers Go Home". however, it is impressively dilapidated. At one point, probably due to the hostility they are experiencing on the main road, the three decide to take off across the Outback via a dusty secondary road. Due to the less than reliable transport, they break down in the middle of the desert. That night an Aboriginal Australian takes them back to his encampment where the trio perform their act for them. Bernadette goes off hiking looking for help. Meanwhile, Adam decides to redo the bus in a bright lavender paint job. The bus arrives in Alice Springs where, surprise surprise, Tick also has a son he hasn't told the group about. Australian movies had been getting attention in the states before now (Crocodile Dundee, Mad Max, The Man from Snowy River just to name a few). 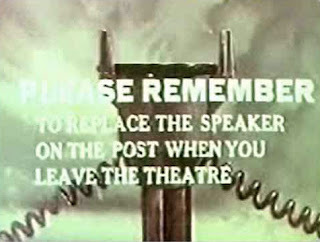 This movie helped to spur the ongoing craze for the quirky tpe of movies for which the movies from Oz became known. At some point in the future I intend to do my own Oz-fest posting, as there are about 4 or 6 on my future post schedule from Down Under. If you haven't seen this movie, you are indeed missing out. Two he-man studs of the action-adventure genre, Patrick Swayze and Wesley Snipes, stepped out of their cushy comfort zones to take on the roles of drag queens. Accompanied by John Leguizamo as a third drag queen, this movie is the second road trip movie, somewhat inspired by the previous movie, although, as we will see, entirely different in how it plays out. Leguizamo plays Chi Chi Rodriguez, a runner-up who is devastated by not winning the contest. (Here, again, I interject my opinion. I kept having to remind myself that "Chi Chi" was indeed a man in drag. He, of the three, pulled off the role of a drag queen the best.) Vida convinces Noxeema to trade in their air tickets to buy a car and take Chi Chi with them on their trip. To achieve this they go to a restaurant run by a friend, John Jacob Jingleheimer Schmidt (really!) , played by Robin Williams. With Williams help they are given access to a car dealer who lets them have a land yacht of a Cadillac convertible. 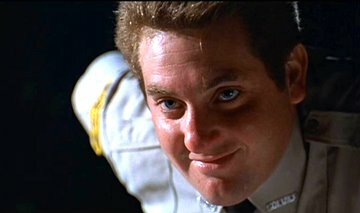 Somewhere in the midwest (it's never actually said which state they are in, but a lot of the outdoors portion of the movie was shot in Nebraska) they are pulled over by a sexist, racist and homophobic Sheriff Dollard (Chris Penn). Initially Dollard thinks they are really all women and tries to molest Vida who knocks him out. They think, however, he is dead, and race for their lives to get away from the scene. The rickety old Cadillac breaks down however, and the three find themselves at the mercies of the elements. Fortunately they are rescued by Bobby Ray (Jason London) who takes them into his hometown of Snydersville. 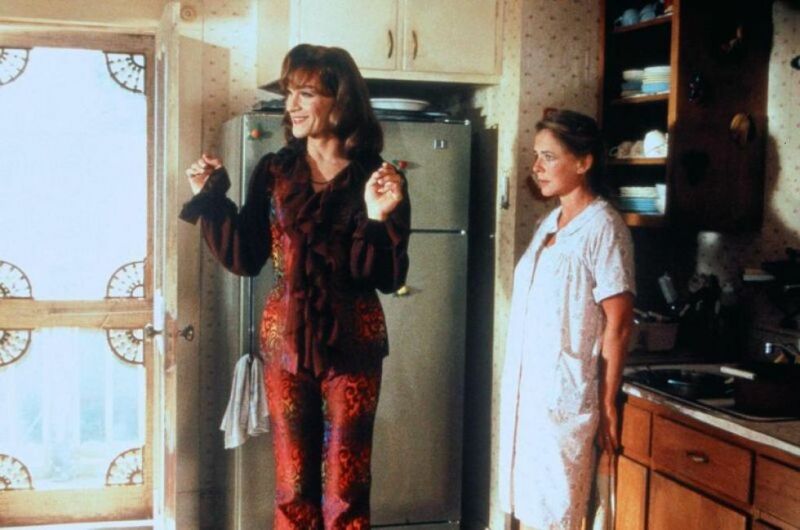 Their car is towed in by Virgil (Arliss Howard), and they are given a room in the town's hotel, also owned by Virgil and his wife, Carol Ann (Stockard Channing). Almost everyone in the town is totally oblivious to the fact that the three are not what they seem to be (although it is revealed later in the movie that Carol Ann was clued in from the very start.) The three have an incredible influence on this small town America, each in their own various ways. Vida tries to be the typical busybody, although in her defense, Virgil is a scumbag wife-beater, and her interventions is well needed. 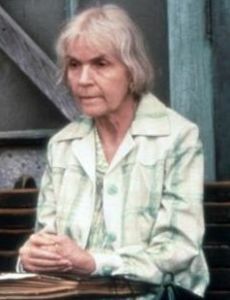 Noxeema meets an older woman who was once the proprietor of the town's movie house, whom she gets to come out of her shell. Chi Chi has a crush on their rescuer, who has a crush himself, although he does not know Chi Chi's true nature. Vida and Noxeema chide Chi Chi for leading on poor Bobby Ray, especially because Chi Chi is a man, but also because Bobby Ray has a lovelorn admirer there in Snydersville himself, Bobbie Lee (Jennifer Millmoe). 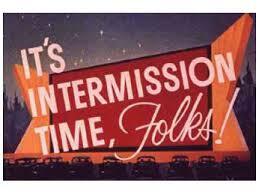 All's well that ends well, in this story though because Chi Chi relents and lets Bobby Lee have her beau. When Sherriff Dollard, who was only unconscious and not dead, shows up, all hell breaks loose, comedically. The homophobic sheriff calls out for the drag queens to show themselves, and everyone in town identifies themselves as the drag queens for which he is looking. Folks, this entry is one for the books. 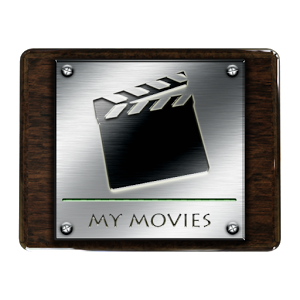 If you have been a frequent reader of this blog, you will realize these were not the typical "man cave" movies I am wont to usually reviewing. But let it not be said I can't come out from under a rock and watch a couple of good movies that would not usually fit that niche. Hope you enjoyed this entry. Hi Quiggy - Bravo, applause, standing ovation! Thanks for this amazing post, and for your compassionate words. 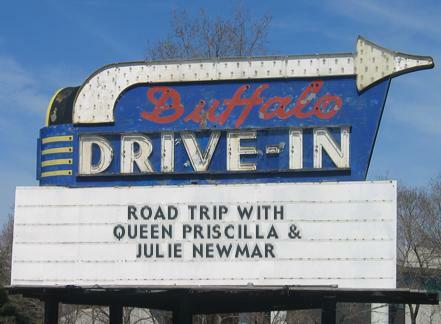 And you have chosen another perfect double-feature for the drive-in. 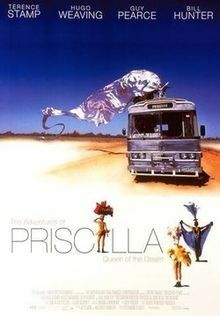 Priscilla is one of my all-time favorite films...I concur wholeheartedly that Terence Stamp dominates this film with his absolutely bold portrayal of an aging drag queen. (Who would have thought that one of the British screen's biggest 1960s heartthrobs--and one of the greatest screen villains as well--I love him as Zod in Superman II--could make this transvestite character an icon?!) But Hugo Weaving and Guy Pearce lend amazing support, and the movie has a lot of heart and soul. That's why I love it so very much. 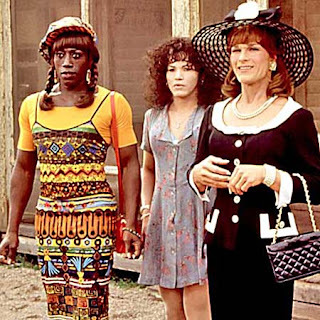 To Wong Foo is a movie I appreciate more than love. It really is kind of an Americanized version of the Aussie film, and I do applaud Patrick Swayze and Wesley Snipes for stepping away from their macho movie personas for this. John Leguizamo is most believable in his role, though, and the prettiest of the three in his costumes! Thanks again, Quiggy, for another very satisfying double feature. I always look forward to seeing what's playing!! On the opposite side, here, Chris. 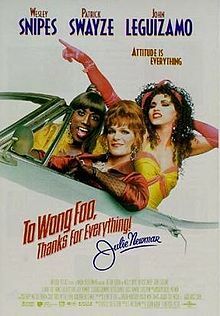 I find Wong Foo to be the more enjoyable, probably because no one (at least no one innocent) gets beat up. I always liked Hugo Weaving's rather austere looks, though. And of course, Stamp is among my top favorite actors from outside the U.S. Thanks for reading.